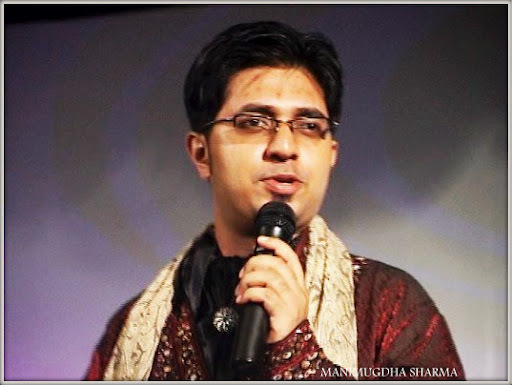 “My folks had been telling me for long to do stories on the Northeast. Good stories can be found in plenty over there. But when the Sunday Times editor himself asked me to find good stories from the Northeast, I actively started looking for some. My parents knew a wee bit about Jadav Payeng as we had spent eight years in Jorhat in the 90s. I was speaking to my mother one day when Payeng suddenly came up. She asked to speak to my uncle, Shashi Phukan of Bismoi, for more information. That I did. Through him, I spoke to a few more people before finding Payeng himself. We had the story in February, but couldn’t get proper photos, which is why we had to wait till the end of March to put it on the page. I am no nature lover, honestly, but I bow before people who show a high degree of commitment and dedication to nature and wildlife conservation.” This is what Manimugdha said when I asked him what inspired him to write this brilliant story. I met him through Fried Eye Magazine about three three years back and since then we have been very good friends. Manimugdha is a renowned quiz master from Assam who has been associated with print media since last seven years.Presently he is working as a chief copy editor in Times Of India.This is how he likes to introduce himself -An ardent history buff, disgruntled movie fanatic, frustrated lover of literature and the Indian cricket team, romantic fool of the highest order,journalist, die-hard quizzer, random thinker, well-known chatter-box, brilliant architect who builds castles in the air, self-proclaimed philosopher, a truly wandering soul with a desire to leave my mark in the sands of time. This story is written by Manimugdha and it was previously published in Sunday Times TOI. I thank Manimugdha for sharing this story here on my blog. 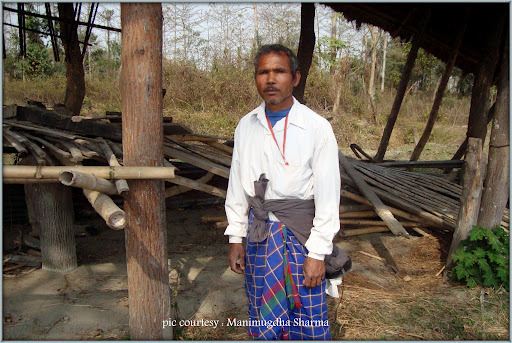 Jadav Payeng :The man who made a forest. make his readers fall in love with trees, and more importantly, planting trees. Assam’s Jadav Payeng has never heard of Giono’s book. But he could be Bouffier. He has single-handedly grown a sprawling forest on a 550-hectare (55 square kilometres) sandbar in the middle of the Brahmaputra. It now has many endangered animals, including at least five tigers, one of which bore two cubs recently. Sunday Times found this sprawling forest and the man who made it after a hard negotiation with Mother Nature, literally. The place lies in Jorhat district, over 350km from Guwahati by road. You have to go off the main road at one point, take a smaller and shabbier road for about 30km to reach the riverbank. There, if you are lucky, you will find a boatman to ferry you across to the north bank, from where you must trek for another 7 km to reach destination. Locals call it ‘Molai Kathoni’ (Molai’s woods) after Payeng’s pet name, Molai. The genesis of the forest dates back to 1979. During the floods that year, the barren sandbar had crawling visitors washed ashore by the torrent. When the water receded and it once again became safe to navigate the river, a 16-year-old Payeng went to the sandbar one day and found it dotted with dead snakes. That was the turning point of his life. “The snakes died in the heat, without any tree cover. I sat down and wept over their lifeless forms. It was carnage. I alerted the forest department and asked them if they could do something to grow trees over there. They replied in the negative and said nothing would grow there. Instead, they asked me to try growing bamboo, which I did. It was painful, but I still did it. I was alone; there was nobody to help me; in fact, nobody was interested,” says Payeng, now 47. He left home and education behind and made the sandbar his home—a decision that was criticized by everyone dear to him. But he didn’t flinch. Unlike Robinson Crusoe, Payeng willingly accepted a life of isolation. And no, he had no Man Friday; he himself watered the plants every morning and evening and did the necessary pruning. After a while, results started to show; and after a couple of years, the sandbar transformed into a bamboo thicket. “The experiment was successful and I decided to grow proper trees. I collected seeds from here and there and planted those in the sandbar. I also transported red ants from my village, and while doing so, I was stung multiple times. That was some experience!” Payeng says, laughing. In 30 years, Payeng says, he has grown thousands of trees all by himself. And this he did without any monetary help from either the government or any NGO. By predators, Payeng means humans, too. He cites a recent incident when locals killed a rhino seen in his forest at another forest in Sibsagar district. Poaching has been one of the biggest problems in the national parks of Assam. Payeng himself had alerted the forest department after he spotted a bunch of poachers in his forest. “I think they were part of an inter-state gang, two of which were caught on camera inside the Kaziranga National Park two weeks ago. After I alerted the department, a handful of guards came to my forest and nabbed those poachers,” says Payeng. herd of 100-odd wild elephants strayed into the forest after a marauding spree in a few villages at Aruna Chapori nearby. Amongthe homes destroyed was Payeng’s hutment. It was then that assistant conservator of forests Gunin Saikia met Payeng for the first time. We were a tad surprised to find such a dense forest on the sandbar. Locals, whose homes had been destroyed by the pachyderms, wanted to cut down the forest; but Payeng dared them to kill him instead. He treats the trees and the animals like his own children. Seeing this, we decided to pitch in at an individual level. Help from the government wasn’t forthcoming; in fact, it was only last year that the social forestry division decided to extend Payeng’s work and took up plantation work on a 200-hectare plot. This forest is acting as a corridor for the movement of wild animals from Kaziranga to other parts, which is good. This way, the scope of man-animal conflict will reduce substantially. And there lies the importance of Payeng’s work. It is easier to construct a building, but very difficult to grow a tree. What amazes me is Payeng’s grit and dedication—he has been at it for 30 years. Had he been in any other country, he would have become a pre-eminent authority in environmental issues,” Saikia says. Nevertheless, the government has been found wanting when it comes to taking steps to declare it a conservation reserve. Former Doner minister and Congress MP from Jorhat Bijoy Krishna Handique has recently taken interest in the forest. “I am going to moot a proposal to the Centre on behalf of Assam government to declare it a conservation reserve under provisions of the Wildlife (Protection) Act, 1972. We will meet in New Delhi just before Bihu (April 13-15). I am hopeful of a positive result,” the MP told Sunday Times. He, too, agrees that it is time for the world to stand up and take notice of the man who grew a forest. Payeng would be happy. I am writing this mail with the intent of sharing with you all a moment of joy. I believe all journalists report issues with the hope that somebody somewhere will take notice and do something to change things for the better. And whenever somebody does take notice, we feel encouraged all the more to find more stories that have the potential to touch human lives. This year’s Shanmukhananda Awards have given me one reason to be happy about—five of the seven awardees this year were selected on the basis of The Times of India reports of which three were mine. In a letter to TOI, V Shankar, the president of Shanmukhananda Fine Arts & Sangeetha Sabha, a charitable trust based in Mumbai, confirmed this. The trust is celebrating its diamond jubilee this year, and to mark the occasion, they are conferring seven ‘Diamond Awards’ on people “who by dint of devotion to duty and exceptional commitment to the field of pursuit have added to the reservoir to goodness of our ancient land. Most of them have been unseen, unsung but have gone about their work, despite the sufferings and the hardships that the system have inflicted on them”. The trust has decided to give out the awards in the following categories: ‘dignity to human body’, ‘honesty and probity’, ‘healthy mind, body and longevity’, ‘folk art’, ‘environment’, and ‘nation building’. And the awardees are T Mahadeva from Bangalore, M C Suresh from Kerala, Manohar Aich from Kolkata, Jadav Payeng from Assam, Nemi Bhagat Baba from Rajasthan, E Sreedharan and Horizon (NGO) from Pune. Assam’s Jadav Payeng took 30 years to single-handedly convert a 550-acre barren sandbar in the Brahmaputra into a lush, green forest. I wrote about him on April 1 this year; the story had the headline ‘The man who made a forest’ (http://timesofindia.indiatimes.com/home/sunday-toi/special-report/The-man-who-made-a-forest/articleshow/12488584.cms). The awards will be presented by former President of India, Dr A P J Abdul Kalam at an elaborate function to be held at the Shanmukhananda Theatre in Mumbai today. Each award carries a cash prize of Rs 2.5 lakh, a citation, a trophy, and a lamp. Hey Kavita, You are looking swell in the profile picture! !The post is amazing. You have always shared these wonderful actions of selfless people with your readers. Very inspirational like always. Very interesting and informative, I always learn so much from you. Thanks for sharing this. I hope you have a wonderful weekend! I’m just dropping in, saying hi and hello. Dr ji..u r always in our mind..v bloggers luv u..
Hi Kavita, I am a journalist with a news channel in Delhi called TIMES NOW. I found Payeng's story very inspirational and would love to feature him in our channel. Can you provide me with his contact details if possible. And one more thing does he only speak the local Assamese language? Zubina, I think that Manimugdha would be the best person to help you in your story. His eid is quizzicalguy@gmail.co. Best wishes. Hello Kavita, It is really a nice blog with Assam flavour. It has been added in the Bisarok – Assam Search Engine. Keep it up.